Whistler is proud to host the annual Whistler Pride and Ski Festival, one of the biggest and best gay and lesbian ski weeks in North America. The LGBTQI pride week features a packed events schedule of skiing, snowboarding, parties, arts and culture and social events. Book early to save on accommodation and stay and ski packages. This is an overview of events from 2019, please check back for updates on 2020 events. With 8 days filled with incredible events the energy and diversity of the festival is reflected in the schedule. 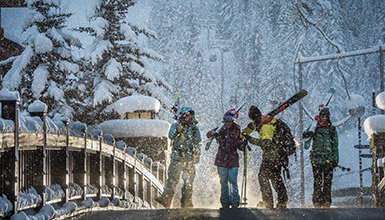 Enjoy Whistler Blackcomb's incredible terrain for skiing and riding each day and a new social event every night. Here are a few must-see events the festival is known for, but there's plenty more! Join the annual Pride Ski + March where skiers and riders start on Whistler's mid-station on the Olympic Run and swoosh down the slopes in a sea of colour. Rainbow flags are carried with pride and skiers and riders dress in colour outfits as they descend down to Whistler Village at Skiers' Plaza. The giant Pride Flag is transferred from skier to marchers as the crowd continues down the Village Stroll to the Olympic Rings at Whistler Olympic Plaza, paying homage to the start of the very first Pride House at the 2010 Olympic and Paralympic Winter Games. After the parade, join the celebrations at the Whistler Conference Centre for an afternoon après-ski T-dance. 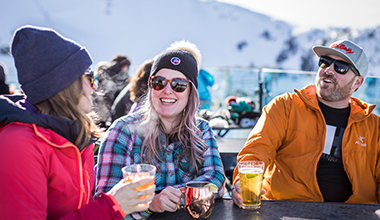 After a fantastic day on the mountains, at the spa or simply hanging out in the Village, come together to meet and greet other festival participants at après-ski before heading out for the night. View the full schedule for locations and times by day. It's time to 'Fly High' to the stars and beyond with International Celebrity Air Hostess, Pam Ann. Pam Ann is back again with her brand-new snow capped show called Flying High. This entertaining night is not to be missed! Let's get soaking wet! DJ Rafael Calvente turns up the heat at the annual Whistler Pride festival Pool Party. Bring your own towel and swimsuit. Clothes check and lockers available on site. Enjoy wine, beer, and music at the Scandinave Spa pavilion and experience the traditional Scandinavian baths in a peaceful and natural environment. International DJ and Grammy-nominated Producer, DJ Abel headlines Whistler Pride's main event. The festival pulls out all the stops and transforms the Conference Centre into a mega nightclub you would find at other world renowned locations. Sensational sound and visuals, stunning go-gos all tricked out and wired to impress! This is one club event you must experience! New to Whistler or simply looking for ski or snowboard buddies for the week? Meet on the mountains for the Whistler Pride and Ski guided groups and make new friends - all levels welcome. Meeting location changes by day, view the full schedule for more details. Alpenglow Productions Corporation (APC) is a certified LGBT Social Business Enterprise through the CGLCC (Canadian Gay Lesbian Chamber of Commerce - Certified Diverse Supplier). Whistler is proud to be the destination of choice for gay and lesbian travellers year round, featuring a diverse community, TAG Approved accommodation and legally celebrated marriage equality. More information. It's called 'the hottest week of the winter season' for a reason, there's more to Whistler Pride and Ski festival than skiing and Snowballs.